This will be a useful little circuit for anyone wanting voltage doubling and negative voltage from a single charge pump. I've done this with a particular layout in mind, but I think it may come in handy for a few effects that require +/- supplies, which can now be accommodated with a small daughterboard. I don't know if this will work with our more commonly used ICL7660S although the pinout does appear to be the same. The schematic called for LT1054 which are more expensive, but I only paid about £5 for 5 on eBay a while ago and so they can still be had for a reasonable price without being fleeced too much. If you do want to try the ICL7660S then it may be worth omitting the cut between pins 1 and 8 to enable the frequency boost so you don't get noise. The LT1054's oscillator typically runs at 25kHz. Using the 1N5817 diodes shown should give you around +/-17V, but if an effect calls for +/-15V then you could always opt for using 1N4001 diodes instead. The extra voltage drop will get you closer to 15V. Could I run a 12v into this and get +/-24v out? You can have up to a 15V input with the LT1054. If you put 12V in you'll get about +/-23V out ish. If you try the ICL7660S it has a maximum input voltage of 12V so I wouldn't risk that one. Would the higher voltage work well with a tonebender mkII? I am building a tonebender as I type this. I can't see too much benefit from running a Tonebender at a higher voltage. The last thing I'd want from one is more headroom and less fuzz. Thanks. I am still fairly new at building and am not when a pedal would benefit from higher voltage or when it would take away from it like in this case. I really appreciate all the information that you and many others post on here. I am learning so much. What started as simple mod to my old Daddy-O pedal, has turned into a full-blown addictive hobby. IC based pedals can benefit from the wider voltage swing because it can give them much more head room and so it will stay cleaner for longer. Something which isn't going to be a desired response for pedals that are designed to be dirty like a fuzz. ICL7660 and TC1044SCPA are pin-compatible with the LT1054, just leave out the cut between pins 1 and 8. Thanks for doing this, I have plenty of boards that could use +/-17V. I built the BK Butler Blue Tube Driver but Harold Sabro's Version as per this Link. There is in "Request Forum - BK Butler" a Post by John Kallas and what he did to quiet this AC Powered pedal. 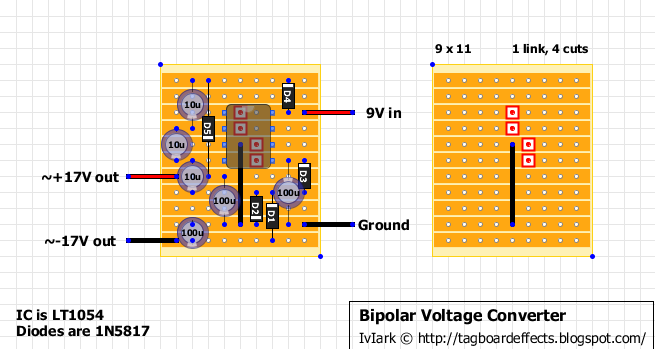 I would Like to use your Bipolar Voltage Convertor on Harald Sabro's Build, but I dont know where to put ~-17V(negative) connection on the Board. ??? Any Idea??? I don't normally Build Pedals that Use AC Power Supplies and don't like the noise/hum I am getting with the normal AC Power Supply. Thanks. Sorry Jon I missed this post, did you get sorted out? Yes, the ICL7660S is the important bit. The suffix just denote things like package type (DIP8 or SOIC) and the temperature range. So as long is it's DIP8 I wouldn't worry about anything else. No you need the ICL7660S****. If you get the one without the S it has a lower frequency oscillator in the audio range and your pedal will very likely squeal. So I'm planning to build a fuzz face (with voltage sag down to zero) using this, and was wondering how the grounding works. Does it just share the original ground, or use the positive out as the new ground? Why are you using this for a fuzzface? A normal fuzz face will run off 9v so you dont need bipolar power supply. I wanted to try extra voltage in addition to the lower ones, essentially giving me a range of 18 to 0. Using this would be a lot easier than adding a second charge pump. Im thinking about using this to power a PLL, any diode suggestions to get +/-12v or should I just use a trimmer? I have the same issue, would love to see a layout for +/-15v and +/-12v from one negative ground 9v source using a LT1054. Weird... I built this one with 1N4001s, but still get -17 and +17v readings. Any idea's you to trim it down to 15? What was the solution brotherleech? Is it to just use the power supply from the Rusty Box or were there components that needed swapping etc? How can I do to reach 30v? Can I add the -15v to +15v or what? Just curious, where you plan to use the 30V supply? Common method is to use -17V on dual opamp pin 4 and +18V on pin 8. This way the IC sees 34 volts as its supply voltage. I'm interested in building the Sunn Beta circuit that's on here and I see it requires 15v power. If I understand correctly, this should definitely be my solution to powering it from a standard 9v power supply, but how much power do you think this specific circuit will draw? I plan on making this a stomp box and adding it to my board which currently has a Voodoo Lab ISO 5 power supply. Can I power this with one of my 100mA outputs, or would I need to use my 400mA? Or am I going to have to get my hands on another power supply? I'm kinda lost here. Can this be modified to output +17 and -9v? The reason I ask is that I have an old Roland SH101 synth, which used (a now unobtainable) DC coil converter to produce +18v and -9v from a single 9v plug pack. A circuit like this would be ideal to replicate desired voltages! Pin 5 of the IC gives you the supply voltage inverted and so should be at -9V. You can omit D1, D2, D3 and the bottom left 100u cap as well along with the 10u a few rows above it. Removing those components means you should be able to shave a few rows off the layout as well if you want to save a bit of space. Just move the lower ground connection one row up to the now unused row, and omit the bottom 2 rows completely. One thing to bear in mind is you're limited to a 100mA output current, so you will want to check the requirement of the SH101. Put more circuits in parallel if more current is required. Thanks for that. I guessed that would be possible once I had a look at the datasheet. Still trying to find out current draw for those parts of the SH-101 circuit but I'm pretty sure it's well under 100mA. Hi, was looking at building this for the Sunn Beta Preamp. Is there any benefit of using 7815 and 7915 to regulate the +/-17V at 15V? Also the 7815 etc datasheets nominate input voltage at 23V, anyway of tweaking circuit to that, if regulators are required. Cheers, Chris. 78xx series regulators dropout voltage is 2V, so technically you could, but you can achieve that with simple diode choice. Hi. I'm going to build a Boss CE-1 and I need +/-14v. You said by using 1N4001 we could get 15v. Would it be wise to try other diodes to see if I can get the 14v? I was building the sunn beta but my 1054 gets very hot.. about 60 degrees Celsius. Who else can say that about his charge pump in combination with the sunn beta ? Does the ICL7660 provide more current? with the +/-9v and ground ?